Home Motivation Motivation Videos What promotes uptake and retention in group-based weight management services? We live in an increasingly obesogenic environment, making it harder for individuals to avoid unhealthy lifestyle choices. This leads to greater proportions of the population being overweight or obese, which are the main modifiable risk factors for Type 2 diabetes. For obese people, there is a seven times greater risk of diabetes compared to those of a healthy weight, and for overweight people the risk is three times greater. Joining a group-based weight management programme is a commonly chosen route for people who want to lose weight. 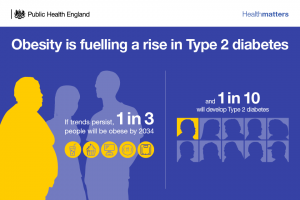 In addition to the many commercial programmes that are available, the NHS offers group-based programmes specifically to individuals at risk of Type 2 diabetes, through the Healthier You: NHS Diabetes Prevention Programme (NDPP). 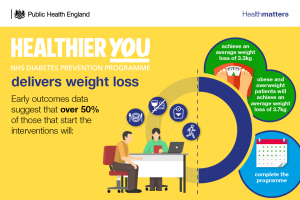 The NDPP – a national programme for England – aims to identify people at high risk of Type 2 diabetes and refer them onto a behaviour change programme for weight management. Due to the increased risk of Type 2 diabetes for obese and overweight people, these programmes are a central component of many NDPP services. There is a range of practical, socio-demographic, psycho-social, contextual and behavioural factors that impact upon initial and regular attendance at group-based weight management interventions. Studies have shown that people who access and remain engaged with a programme for longer tend to lose more weight, so, it’s vital that we have a clear understanding of what encourages people to start and remain engaged. To address this, PHE’s Behavioural Insights team worked with researchers from Staffordshire University to conduct a literature review and behavioural analysis. First, the team at Staffordshire University conducted a literature review, which looked at the published qualitative and quantitative literature on these programmes, and collated information on the main commercial programmes. They also conducted a behavioural analysis, which investigates the drivers of behaviour using a behavioural framework. Two behavioural tools were applied to the qualitative and quantitative results in the literature. One tool was used to classify drivers of participant uptake and retention, and the other to identify specific behaviour change techniques – in terms of programme recruitment methods and intervention design – associated with high uptake and retention. These were then mapped on to the behaviour change wheel’s ‘Capability’, ‘Opportunity’, ‘Motivation’ and ‘Behaviour’ (COM-B) model, which was used as a framework to inform recommendations regarding which intervention components promote uptake and retention. The behavioural analysis found that individuals with the motivation to attend, and the knowledge and psychological skills to change their behaviour were more likely to take up group weight-management programmes. However, it was found that for motivation to be effective, social opportunity is particularly important. Those who perceived a lack of social support from family and friends, or feared stigma from attending the programmes, were less likely to enrol. The analysis also found that the main barriers to continued engagement were a lack of social support outside of the programme from family and friends, as well as practicalities of attendance, such as a lack of time and competing commitments. When these factors were mapped to the COM-B model, it was clear that social opportunity was the dominant component in relation to retention. How can we maximise uptake and retention? There is an increasing amount of evidence from behavioural insights that the method in which people are invited to take part in preventive health programmes influences participation. As such, there is need for greater consideration and specificity in the reporting of recruitment methods of group-based weight management programmes. Reporting has generally lacked detail to date, making it difficult to discern patterns in relation to uptake. You can read more about the NDPP in our previous edition of Health Matters.